Yes, we are going on a big summer/autumn climbing road trip starting August 7th. We will be on the road for 7 weeks driving around in Europe. We will visit classic climbing destinations like Chamonix, Val di Mello and the sunny rocks of Provence, but also more unknown destinations like the sandstone crags in Alsace, France. We will be driving around in a trusty camper van, a white VW California 1993 2.4D equipped by Westfalia. We did a successful test run this weekend to Kulleberg in Sweden. We had good fun sleeping in the camper and trying the facilities in the car. I will try to keep this blog updated when we are on the road, documenting our climbs and life on the move! 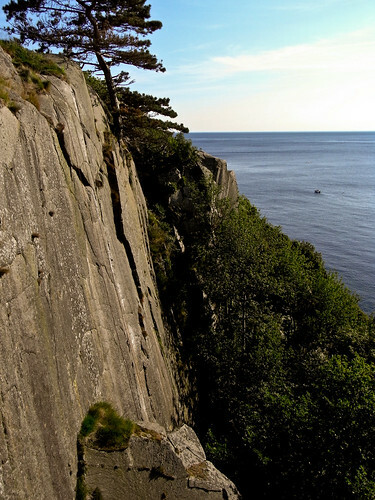 Last weekend I was back on Bornholm with Kim to do some new routes. We made a new three star in the area of Vang South. It’s a fantastic line that follows a thin seam for 28 meters. The route was done on aid at A2 in the 90’s by the legendary Danish climber Peter Harremoës. I did the first free ascent on the 4th of July and this is by all means the hardest, and most sustained route I have ever done. I propose the grade of F7a+, but I am of course very curious to see how other climbers rank the route. The strong British climber Steve McClure is coming to Bornholm later this month, so I hope I can get him to confirm the grade.